Food and beauty have a long history together. A symbiotic relationship that goes moisturized hand-in-moisturized hand together. What we put inside our bodies have often found a place on the outside of our bodies. Go into any Ulta or Sephora and you will see the beauty products boasting its use of food: moisturizers made from avocado, seaweed toners, and coffee-infused eye serums. Pinterest and beauty forums are a mecca of homemade DIY beauty recipes claiming your kitchen is all you need to get even-toned, plump skin. But can it all be done on a Sunday Funday? I believe I’ve curated the best self-care Sunday afternoon, so that you can lounge in your sweats in front of the TV and yell at the sports commentators just to make sure you can still interact with other humans. This day is for you. Start your self-care Sunday by waking up late. No need to set that alarm: Wake up when you wake up, because like my mom always said when I slept in, “Your body must’ve needed it.” Put on those sweats and get your lazy day started. Time to wake up, sleepy head. This treatments help with under eye puffiness and circulation. Whether you’re a coffee or a tea person doesn’t matter here, you can use one or the other. Coffee: If you enjoy coffee, brew yourself a cup of coffee. Enjoy it. Then, scoop a tablespoon of the leftover grounds into your hand and gently pat the grounds underneath your eye. The skin right underneath your eyes is sensitive, so don’t rub or drag the grounds—pat them on delicately, preciously, and with a light touch. To remember, just channel your Mufasa and repeat, “Look, Simba. Everything the light touches is our kingdom.” If you don’t have a light touch, Simba won’t be able to open his eyes and see his kingdom. Green tea: Don’t like coffee? No worries! Green tea just like coffee is filled with antioxidants and caffeine, both which contribute to decreasing inflammation or puffiness under your eyes. Spilling the beauty tea for you all, you’re welcome! Heat up some water in the kettle and let your tea bags steep for 3-5 minutes; this is for your beverage. Then, instead of tossing out those tea bags, set them on a plate or saucer, if you fancy, and let them cool down a bit. (Do not put scalding hot tea bags on your face.) After they’ve cooled a bit, place the tea bags under your eyes and relax. Listen to a podcast. Imagine your best self, living your most esteemed life, but only for about 15 minutes, and remove the tea bags and pat away any excess moisture. Time to take a shower, you filthy animal. This will help your hair, according to beer legend. This tale has been shared on the internet for as long as time itself: Beer showers can make for healthy hair. The malt and hops in beer apparently provide protein that strengthens your hair and enhances shine. You may be able to find some beauty products that incorporate beer into their shampoos and conditioners (anyone remember Body On Tap shampoo from the ’70s?). But if you’re going to shower with beer, why not go straight for the real stuff and also be able to drink it while you’re in there? This one, however, may not be for everyone. I recently tried using the Hop Lift IPA as a shampoo. Initially, I was concerned, surprised, delighted, and, finally, disappointed. I washed my hair with a cold beer and that is not something I would do, again. The anticipation of the coldness hitting my head and skin was one of the most unpleasant parts. I’m not a fan of living in the tense, bracing moment of anticipation before cold hoppy suds reality hits you. I couldn’t do the ice bucket challenge, because of this, but then again I was never nominated. Beer washes is rough, like showering in hard water, but it surprisingly washes out smooth. I was really pleasantly surprised. After I let my hair air dry, though, it felt thickly coated rather than full and shiny. This probably won’t stop me from just drinking beer in the shower, but I may add an extra rinse next time. Time to eat and watch TV, you deserve it. Let’s make some sauces that are also exfoliating and moisturizing face masks. First, assemble some nachos, or grab your favorite chips. We’re going to do two face masks that will also be used to top off your nacho fixings. First sauce: Sour cream. That’s it. Of course, you can make it more complicated, if you like—and I’ll tell you how to enhance it—but I cannot guarantee the enhanced versions will be good on your nachos. As self-proclaimed beauty guru Naomi Sinead, of Naomi Sinead Beauty, wrote me about sour cream facials, “Lactic acid is a type of alpha-hydroxy acid and is the active ingredient in sour creme, which naturally removes dead skin to promote new skin cell generation.” Perfect. Get outta here, dead skin. I scooped full-fat sour cream from the tub into my hands and slathered it on my face. It goes on thick like your grandmother’s Pond’s Cold Cream, but without the waxiness. You will look like Mrs. Doubtfire when she plops her face in a frosted cake and exclaims, “Oh, helloooo!” and this alone makes it worth it. The coldness of the sour cream was soothing and the dairy smell just made it better for me. Enhanced version: Add a banana and/or honey and mix in thoroughly with the sour cream to change the texture. Honey also includes an anti-inflammatory benefit to reduce redness and swelling. 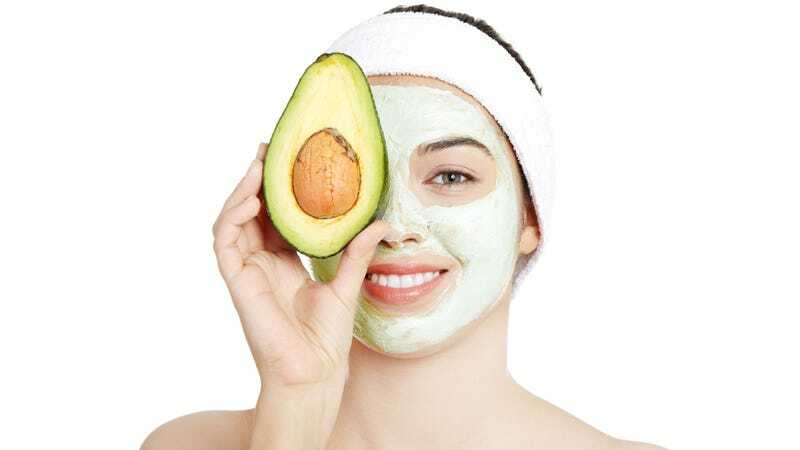 Second sauce: Guacamole, but make it a face mask. Avocado is filled with beneficial essential fats that can be moisturizing for your skin. To make it even better and tastier, add cucumber and aloe vera juice (available at Whole Foods and Trader Joe’s). Take one full avocado; half a cucumber, peeled; and two tablespoons of aloe vera juice and mix in a blender until smooth. The cucumber is hydrating and soothing. David Barbour of Vivio Life Sciences emailed on the benefits of cucumber, “Vitamin C, caffeic acid, folic acid, and moisture content of the cucumber can reduce redness, and swelling around the eye and the rest of your face.” The aloe vera juice provides anti-inflammatory benefits and stimulates the growth of new cells. Apply this mixture to a clean, dry face and leave on for 15 to 20 minutes. (This mask will get a bit tight as it dries. Wash off and pat dry.) Then, scoop the rest into a bowl and use it for your nachos. The taste is a refreshing guacamole. The cucumber provides a light crispness and the aloe vera provides a creamy texture and balance. This might taste better with a squeeze of lemon or lime, but I wouldn’t recommend putting it on your face as lemon or lime acids may tend to throw off your skin’s pH and can be harsh on sensitive skin. Maybe just add some citrus to your dip, not your face. So go ahead, enjoy your Sunday. Watch the game. Wear pajamas all day. Take a beer in the shower. And pamper yourself with food on the inside and out. What&apos;s your perfect Monday-night beer? Does Kool-Aid really work as a hair dye?